Part of the ongoing, limited-edition Harpoon 100 Barrel Series. 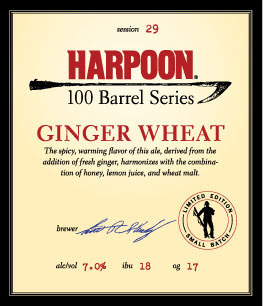 The Harpoon Ginger Wheat is one of the most interesting beers that I've had in a while. As you can expect from the name, the flavor of ginger is prominent and unmistakable, as is the aroma. Yet the beer is good enough to be complimented by the ginger instead of being overwhelmed. The ginger imparts an interesting spicy taste to the beer, and gives a sensation of warmth on your tongue. Of course, the ABV of 7.0% probably helps. The venerable Sam Adams Summer Ale has a similar spicy flavor. The Ginger Wheat is kind of similar to the Sam Summer, with hints of lemon and a lighter body, but with much more of the spice. It is actually quite a refreshing beer, and would probably be great with sushi. I've almost always enjoyed the Harpoon 100 Barrel beers and find them to be generally underrated. Good stuff.